Nothing beats that winter sun feeling when the low sun hits the surface of the swimming pool and shimmers like a Tiffany diamond that’s been freshly polished for a very important engagement! 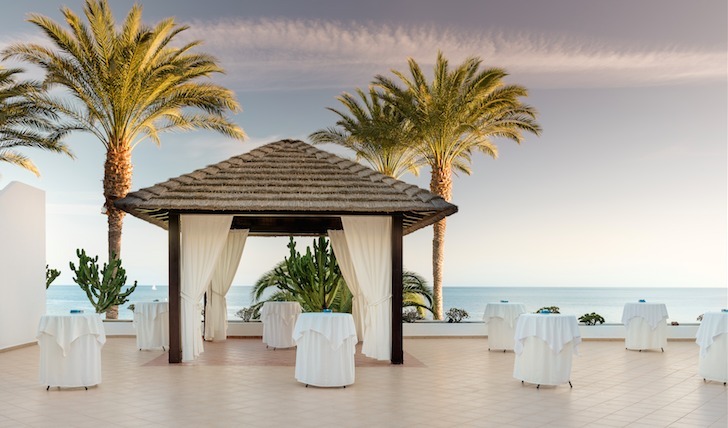 Even more so in January when it barely gets above six degrees in the UK, the Hesperia Lanzarote is the most perfect retreat to escape the cold temperatures, and with flights only four hours from London, why would you not?! The Hesperia is an easy 15 minute taxi ride from the airport, so with hand luggage, I was in reception looking out at the sunshine just five hours after leaving a rainy, windy London behind. With a glass of finest cava in hand while I checked in, I couldn’t help but smile at the ease of it all. The reception area and lounge at the Hesperia is grand – the perfect area in which to relax whilst listening to the pianist with a glass of bubbles on hand in the evenings. After a smooth check in process, I made my way through the winding pathways of the resort. On multiple levels down towards the sea, each corner revealed another magical pool, bar or restaurant. My room was in block D and I really recommend a room here with its huge balcony overlooking the El Drago Tapas Bar which is reached by a cute bridge between two gigantic swimming pools. The balcony I discovered, was also perfect for afternoon sunbathing, with plenty of sun, while also providing respite from the wind. With a view of the ocean from the both the bedroom and lounge room, I couldn’t have asked for more – until I pushed back the sliding doors and discovered all the dreamy bathroom extras and a huge jacuzzi bath with jets! As if that wasn’t enough, there was also a walk-in shower the size of my entire flat at home. After a tagliatelle carbonara and a bottle of Spanish red courtesy of room service, I enjoyed a wonderful night’s sleep in the gigantic bed, before heading to the spa for a coffee and a work out. The gym isn’t huge, but is equipped with everything I could’ve wanted against the stunning backdrop of the indoor pool (extra fees apply). Feeling refreshed, I enjoyed breakfast in the Botavara restaurant of fresh fruit and croissants, and a full english with pots of hot coffee. Wanting to explore, the Hesperia concierge gave me all the information I needed to embark on the coastal hike into the main town of Puerto del Carmen. Down past the impressive marina lined with restaurants and bars, keep going for another 5kms and you’ll finally reach the lovely town with picturesque apartments, a fabulous villagey feel and bars and restaurants galore! Three days flew by in a flash – mainly due to the gorgeous hot sun, comfy loungers and margaritas courtesy of Domingo at the pool bar and before I knew it, I was on the short plane journey back to London. It’s hard to believe the weather can that be amazing just a few hours away from home. With multiple pools, an abundance of sun loungers (so you’re never fighting to get your towel on one! ), and a selection of bars and restaurants in a perfect five star setting, I’d absolutely recommend the Hesperia Lanzarote. With an all-inclusive option available, rates are reasonable and flight prices with either Jet2.com or the fabulous Norwegian airline service, I can’t wait to go back and next time, it’ll definitely be for longer than the weekend! A Standard Double room in February from 170€ per night.